I WAS DESPERATE FOR NEW MUSIC ABOUT THREE YEARS AGO. Featured photo © Sonic Highlark. All Rights Reserved. I’m also not the type that usually struggles to find a wide variety of tunes. But at this current juncture, I was in a serious rut of continuously listening to the same bands over and over without anything to really shake it up. It was on the way home from work one day I was listening to 105.7 (an indie/alternative rock station in Atlanta) and “Get Away” by Chvrches came on. And then I was hooked forever. I’m the bearded dude grinning awkwardly next to the pink/red shirt guy near the bottom left. I’m very happy this was taken at a moment when my phone wasn’t blocking my face. Anyway, hearing “Get Away” was just enough to remind myself that I never gave them a chance. So then one day I played “Keep You on My Side,” and immediately Lauren’s voice grabbed me. It wasn’t just her ability to hit high notes, but moreso it was the edgy, powerful, and sort of grunge way her voice bit through my bones. The synthy-pop style also contrasted vastly from Bon Iver or The National which were the bands I had been listening to a lot. Eventually I went through their discography, and discovered their covers, as well as their interviews that kept exposing me more and more to who they were as people — and every part of them just seemed so fresh and genuine. So as soon as I learned about their latest tour that had them coming through Atlanta, I did not wait at all. I also hadn’t been to a concert in a music hall like that since I saw Band of Horses in 2009. That was before they had even released “Infinite Arms,” and in the time since I could probably count the number of concerts I’ve been to on just my hands. There was also a week in 2018 that I passed on seeing both The National and The War on Drugs and thought I was committing a music crime not seeing them when I really could have done it. But Chvrches was the one I knew I had to pounce on, and now here I am a week later still trying to analyze what I just witnessed. It was mind blowing. And before I just sound like a homer, there are plenty of I’d rank ahead of Chvrches for pure music reasons. But as performers, they know how to put on a show with the best of them. Their stage presence is phenomenal. They just create a vibe where they aren’t shy to give you their full energy and ego. They enter the stage like wrestlers and they have an edge the whole time that you can really feel. 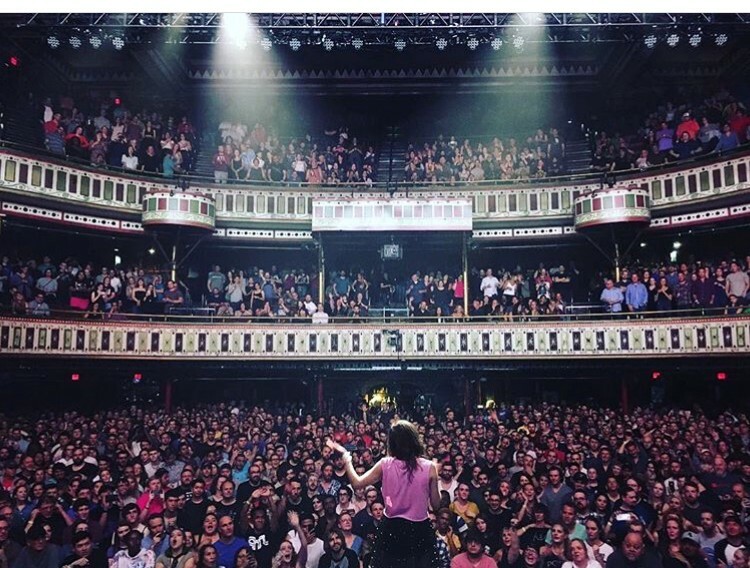 For reference, I saw Band of Horses in the same venue, (weirdly in the same spot of the same venue, too), and the biggest difference between the two was how Chvrches changed my perspective of their recorded material when I went back to it. Not to take anything away from Band of Horses — they were great and I loved that concert. But I didn’t get anything from them that I didn’t know was already there the same way Chvrches revealed more to me about them. For instance, I never considered “Science/Visions” as one of their main songs that would perform live. And in the days since the show I realized they didn’t play “Lies,” which was the song that first got them noticed (even though “The Mother We Share” was the hit that drew fans to them the most). It would have been a cool song to see performed live. However, they blew out “Science/Visions” in a way that got me to see a lot more of their “angsty/punk” vibe that you don’t get as much of when you listen to them on record. Now, I can’t listen to this song without seeing the lights and just the raw emotion that Martin and Lauren both show. There are interviews where they talk about being a pop band, but one that also straddles the line between a pop band and an indie-alternative band. This song really lets out a lot more of those punk/angsty/alternative vibes that don’t come through quite as much in their recorded material. That’s how Chvrches walks on stage. As I said earlier, it’s their stage and Lauren dominates it like she’s Daenerys Targaryan — which is funny because she’s stated before that she believes her stage persona is 25% stronger than her actual self. But you can totally see the difference in her eyes and it’s truly empowering to the audience who reacts like they’re at a rally and Lauren is their leader. It’s quite amazing to experience. However, I can’t move on if I don’t highlight Martin’s portion of the night — which is an entirely different reason Chvrches needs to be experienced live. Whether Dok drinks like 10 Monsters before going on stage, or if his blood has something in it the rest of us don’t — all I know is that this dude radiates energy like a caged wolverine that’s been let loose. He’s amazing, and the most insane part is when you realize he does this every single night on tour. But that stuff reminds you why they’re professionals. It’s not enough to sing the songs. It’s also about the showmanship and giving the fans an experience they will never get from another show. And Chvrches does that in spades!!! This last part isn’t about the concert, but more so about Chvrches as a whole. Not too long I worked for my college radio station where I was debating with another guy about the future of Chvrches. His belief was they were a flash in the pan gimmick that wouldn’t remain popular for long. I guess you could reason with the fact they are pretty novel. I mean, that was the reason I found them appealing from the beginning. They sounded different from everyone else, which is pretty novel. But I made the argument that if they got darker with their subject matter and image that they could find a lot of success by doing that. Which is exactly what they did on their latest record “Love is Dead,” and now they’re experiencing sold out shows everywhere they go on a world tour. I’m not stating this to brag, but to state even further that Chvrches is anything but a flash in the pan, and actually might be THE band this world needs. Think about this. They’ve never had a song that everybody knows, yet they continue to gain more and more success. Which means they’re garnering success in other ways that aren’t necessarily tied to their music, but rather what they promote while taking a single shortcut to get to where they’re at. Photos © Sonic Highlark. All Rights Reserved. They promote feminism, activism, social and political awareness. They are brutally honest, and all it takes is Googling/YouTubing their name before being linked to any one of the progressive stances they proudly stand by, which is different from most bands whose music is their sole product. They also don’t care to be popular or pander to what would help them sell records. As the Guardian reported, they could have sold 200,000 more copies of “Every Open Eye” if they had hidden Martin and Lain from the record and made Lauren the focal point. But the benefit of not selling out and keeping the focus on the entire band comes with the benefit of remaining true to who they are as people. And, now that they are truly poking through and selling out every show, the reward for that is being able to have unlimited creative freedom and expression. They can literally write anything they want without having to meet anyone’s expectations but their own — which is the best way of life: to be your own boss and make a living creating what you want to make. Personally, I would love to see them release an acoustic album of their 10 best songs before their 4th album. They’ve done a few acoustic sets recently that have intrigued me a lot, and I think it would be a good way to test moving away from being so synth focused. Lauren has even stated, “we were making music that was slightly poppier than any of us had done previously,” so it would be cool if they dug deeper into their musical roots and switched it up a little more, even if it just meant taking notes from all the covers they’ve done and still using the synths, but in completely new ways. But whatever they decide for their next record (which I get is unfair to anticipate right after a band puts out a record), I think Chvrches has plenty going for them to keep them around for a long time. They’re too good at the role they play as genuine beacons of unsugar-coated inspiration — which is something I think the world really needs. Becoming pundits for the Jimmy Kimmel type people of the world. Not that I don’t like Jimmy Kimmel or think he doesn’t have a good agenda despite how leftist he comes off, but I think the reason Chvrches’ doesn’t come off as too preachy is because they aren’t pushy about being on a side, nor are they overly-pushy about their opinions. They just want to encourage that people be nicer and treat others better. So my hope is they’re able to stay within their own sphere of influence and not get pulled into someone else’s.